Put the onion and olive in saute pan on medium until onion soften to light gold. Add garlic. Add tomatoes, salt and cook for 20 minutes until oil floats free from tomatoes. Add capers, oregano and pepper. Stir for a minute. Take off heat. Wash fish fillets in cold water. Pat dry with paper towels. The recipe calls for folding the fillets in half, and this is probably because they easily fall apart. 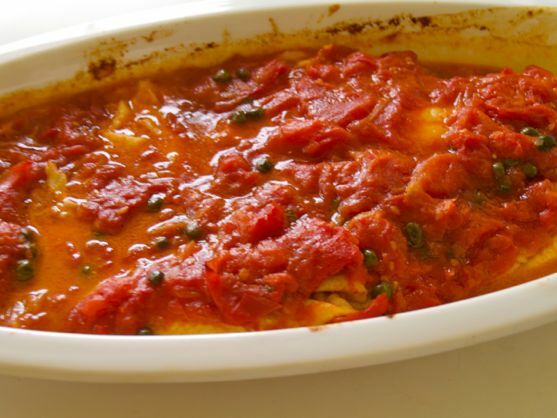 Smear baking dish with tomato sauce. Dip each fillet in sauce, fold. Pour remaining sauce. Put in uppermost rack of oven. Bake for five minutes or until done, but do not overcook.